For those of you who might be into such things: this is a Model 1910 Maxim heavy machine gun used by the Russian Imperial Army and subsequently by the Red Army until it was replaced in 1943. The gun is water cooled (hence the metal tube surrounding the barrel), takes the 7.62x54mmR rifle cartridge used in the Imperial/Soviet Mosin-Nagant service rifle and is affixed to a wheeled Sokolov mount. The weapon generally also has a shield mounted between the barrel and the receiver, but I have been unable to get the damned thing on. This example was probably manufactured in the twenties or thirties and was captured by the Finns during either the Winter War (1939-1940) or the Continuation War (1941-1944). 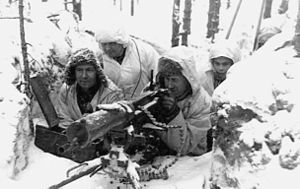 The Continuation War was of course the Finnish participation in the German invasion of the USSR in 1941; the Winter War is more obscure. In 1939 the Soviets demanded territory from Finland, most importantly, the Karelian Peninsula and the eastern part of South Karelia, which they felt threatened Leningrad. The Finns, who would lose their border defenses and a substantial chunk of their economy, refused, and in November 1939 the Red Army invaded, expecting an easy victory. That was not to be. The Red Army had been devastated by Stalin’s purge of the officer corps, and the Finns knew the terrain and fighting conditions. I suspect the origins of the Olympic Biathelon are found in the winter War: ski through the woods, shoot a Russian, ski through the woods, shoot another Russian. The Soviets suffered huge casualties (convincing Hitler the Red Army was weaker than it actually was), but in the end overwhelmed the Finns with their superior manpower and got what they had demanded. The costly resistance of Finland probably contributed to Stalin’s decision not to attempt to incorporate the country into the USSR after the defeat of Germany. 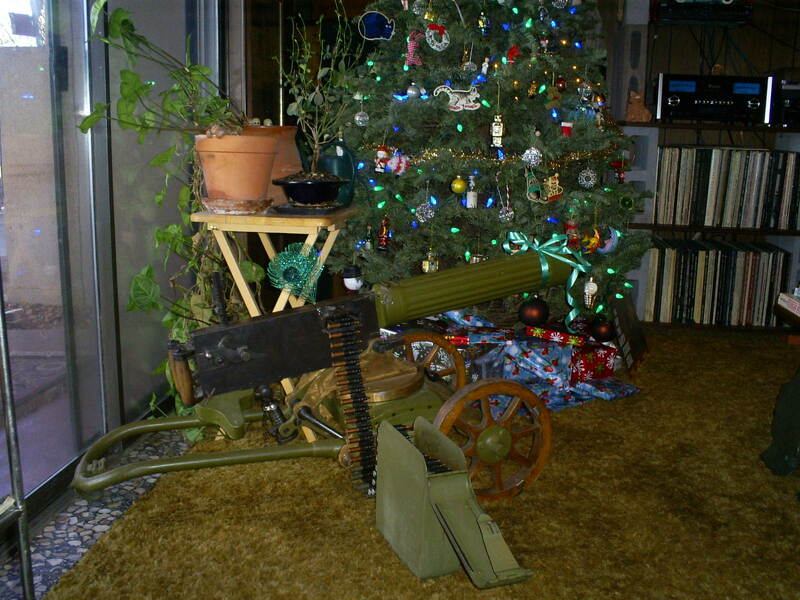 The Finns captured large amounts of Soviet equipment, including the Maxim pictured above, and thus this weapon has traveled from the snows of Karelia to the sands of New Mexico. This entry was posted in Continuation War, Finland, history, Karelia, machine gun, Maxim, Red Army, Russia, Uncategorized, USSR, war, Winter War.